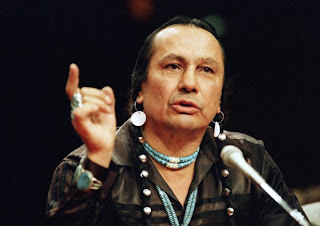 Activist, actor, musician, agitator, politician and former American Indian Movement (AIM) leader Russell Means passed today from esophageal cancer, at the age of 72. He died at his ranch located on the Pine Ridge Indian Reservation in South Dakota, where he was born in 1939. Means was a fierce advocate of American Indian rights and led dozens of protests and uprisings throughout his life ranging from seizing the Mayflower II in Plymouth, Mass on Thanksgiving day in 1970 (protesting discriminatory treatment of American Indians), to orchestrating a 1971 prayer vigil atop the Mount Rushmore monument in South Dakota (dramatizing Lakota claims to the Black Hills), to organizing cross-country caravans in 1972 to Washington, D.C. (protesting a century of broken treaties by the U.S. government), to leading a boycott of Cleveland Indian games in the 1990s (protesting the use of Chief Wahoo as a racist, caricatured mascot/logo). Russell Means is most recognized for two well known portrayals, though very divergent: First, he led a 1973 occupation of Wounded Knee, South Dakota, the site of the 1890 massacre of more than 350 Lakota men, women and children, often referred to as the last major conflict of the American Indian wars, where protestors demanded strict adherence by the federal government to all Indian treaties. Second, he starred as Chingachgook in Michael Mann's 1992 epic "The Last of the Mohicans" alongside Daniel Day-Lewis and Madeleine Stowe. Means used his notoriety to advocate on behalf of equality on behalf of American Indians until his untimely death. 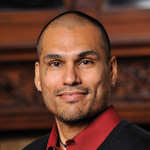 SpearIt, a law professor at Saint Louis University, has recently penned an op-ed in connection with the state of Washington's ballot initiative on legalizing marijuana. Hip-hop is replete with references to the abject failure of the War on Drugs and the costly destruction visited on urban communities by law enforcement engaged in this war. The op-ed is entitled "Legalize Marijuana for Racial Justice Reasons," and appears in the Seattle Times. From the Seattle Times: "The war on drugs has been a colossal and costly failure, paid for largely with the blood of minority youth. In fact, the history of American drug law is one long story of discrimination against ethnic minorities, including the demonizing of Mexicans in the Southwest for marijuana use." The 2013 Hiphop Literacies conference features keynotes, performances and workshops by leading scholars, educators, and artists and focuses on pedagogies for social change in its attempt to target innovative, critical and activist work that uses Hiphop and popular culture including a wide range of media across geographic and virtual space, diverse populations, and methods for stimulating freedom movement. We are especially interested in student-centered curriculum, integrating media, arts, community-based projects, progressive learning and teaching that are participatory, inquiry-based and interdisciplinary addressing social issues such as impoverishment, mass incarceration, community re-entry, sexism, human rights, language diversity, literacy, education, and social inequality. 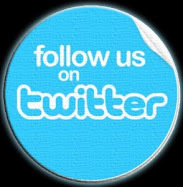 Our goal is to continue to locate and instigate unified critical movement on behalf of critical scholars, researchers, students, teachers, artists, community members and policy makers. The deadline is October, 30, 2012.